The apartment is in quite a new development, with spectacular and panoramic views over the Solent and River Medina. It overlooks a busy marina with its many yachts. It is very close to the quaint and bustling centre of Cowes, with plenty of individual shops, restaurants, cafes and boutiques. Nearby are many tourist attractions, including Queen Victoria’s Osborne House. The apartment would be ideal for those wishing to relax whilst enjoying the views over the Solent. It is ideally located for crew or families who want a comfortable environment from which to explore the island and its many attractions. The second floor apartment (serviced by a lift) offers a spacious living area leading onto a balcony with spectacular views. There is a luxury fully equipped kitchen. The two bedrooms are light and airy, and have views of the River Medina. The master bedroom has an en-suite shower room. There is also a separate bathroom. There is a dedicated parking space and internet/Wi-Fi access is provided. Additional Information on Cowes: There is a full programme of events which cater for the professional and amateur sailor, as well as the keen spectator, particularly throughout the summer months. Attractions include the many regattas, the start of the famous Round the Island race, Cowes Week, Dinghy Week, the Fastnet Race, Little Britain, various power boat competitions, not to mention the carnivals, balls and outside arenas which cater to these thrilling sporting challenges. Cowes and East Cowes grew from a huddle of fishermen's shacks around two coastal forts built by Henry VIII on opposite banks of the River Medina and named after the two off-shore sandbanks or cows. The towns are linked by an old-fashioned chain ferry and have a tradition of fine ship building, dating from the reign of Elizabeth I. Then came the yacht building industry and the rest is history! Many people choose to have a base in the centre of Cowes and it is now possible to do so in the best possible situation and style. Waitrose has decided to invest in Cowes - they have recently opened their supermarket very close to our apartment, just on the other side of the chain link ferry, and close to the Red Funnel berth in East Cowes. How to get to Cowes: Red Funnel fast passenger ferry from Southampton to Cowes every 30 minutes. Red Funnel vehicle ferry from Southampton to East Cowes, opposite the apartment. Wightlink from Portsmouth to Fishbourne and from Lymington to Yarmouth. Fast train service from London to Southampton, (approx. 1 hour 15 minutes) with connection to the Red Funnel ferries. We are a recently retired couple (civil engineer and nurse) based in Surrey with 3 children who are now making their own way around the world. We love the location of this apartment and using it whenever we can. Fabulous location and views, high quality new apartment. Always something to watch on the water, including yachts and big ships entering or leaving Southampton. Very close to Cowes High Street. High spec fully fitted bathrooms with heated towel rails. Both have a shower. One dedicated marked parking bay. Broadband internet access, Wi-Fi and cable plug in at no additional cost. Fully fitted luxury kitchen with all the facilities you are likely to require, including washer dryer. There is a large entrance hall. The hall and the living/dining area are fully fitted with real oak wood flooring. The kitchen area and bath/shower rooms are fully tiled. The bedrooms are carpeted. The stereo radio/CD player will house virtually any 'Ipod' and play its music. The balcony has a table with 4 chairs, to further your enjoyment of the superb views. The central heating system is subtle but effective - it uses the skirting boards as radiators! Access to the waterfront is through a coded security gate. By the front door of the apartment is a video phone, which controls the front door to that part of the apartment block. We loved our short stay on the Isle of Wight. The apartment was spacious and very well appointed. The best we have stayed in so far. Fantastic views over the marina which was so interesting. We had some excellent walks and found public transport very easy and convenient to reach the south side on a day trip. Cowes is a super little town. We ate well in The Anchor Inn and also enjoyed some live music there. A refreshing break from all the Brexit nonsense! Loved the Isle of Wight, so much to see and do and made all the nicer being able to relax in a beautifully appointed apartment with lovely views across the Solent, after a day out exploring. Would love to come back if the opportunity presents. We choose this apartment as there was a view of the harbour from the window. It was great for my father who was very happy watching the comings and goings of the ferry. The beds are comfortable and there is plenty of room to relax. We were met by Samm who was really helpful and was on hand if there were any problems - which there wasn’t. If we return to Cowes we would book this apartment again. Very well-placed, with fantastic views over the harbour. We spent hours just watching the boats on the water, which included cruise ships passing by from Southampton, and the ferries from the mainland. The town centre is close by, and the floating bridge is on the doorstep, taking you across to East Cowes, where there is a good Waitrose only a few minutes walk away. Be warned, however, that the floating bridge is not cheap to travel on! There are plenty of things to do on the island and none of them too far away, of course. We enjoyed visiting Winkle Street (with a good pub nearby for lunch), and Butterfly World. Ryde was nice, and we watched the hovercraft coming in and taking off again. It brought back memories of my first trip to the Isle of Wight in the 1960s, when we travelled over in one of the first passenger hovercrafts. During our week's stay, we saw most of the island. Is very high and not easy for anyone to enter. It was our first time on the Isle of Wight. Near to town for restaurants and transport. The apartment was very spacious and tastefully decorated. Really good and would recommend wholeheartedly. The Isle of Wight is a beautiful island offering many activities for all. It is a perfect place to enjoy a relaxing break, family holiday, or partake in many of the activities available, at any time of the year. It is world famous for its sailing regattas. For those who wish to escape the modern world, the Island offers the visitor the opportunity to step back in time. Over half the Island is designated an Area of Outstanding Natural Beauty. There are many footpaths stretching over 500 miles. Why not indulge yourself in the Isle of Wight's fine restaurants, art galleries and historic houses? Queen Victoria's Osborne House is a short walk the other side of the Chain Ferry. No where in the world conjures up images of the sailing scene like Cowes. Steeped in history, this charismatic town is a Mecca to yachtsmen and women from around the globe. The town of Cowes faces the Solent and witnesses one of the most spectacular water sports arenas in the world. 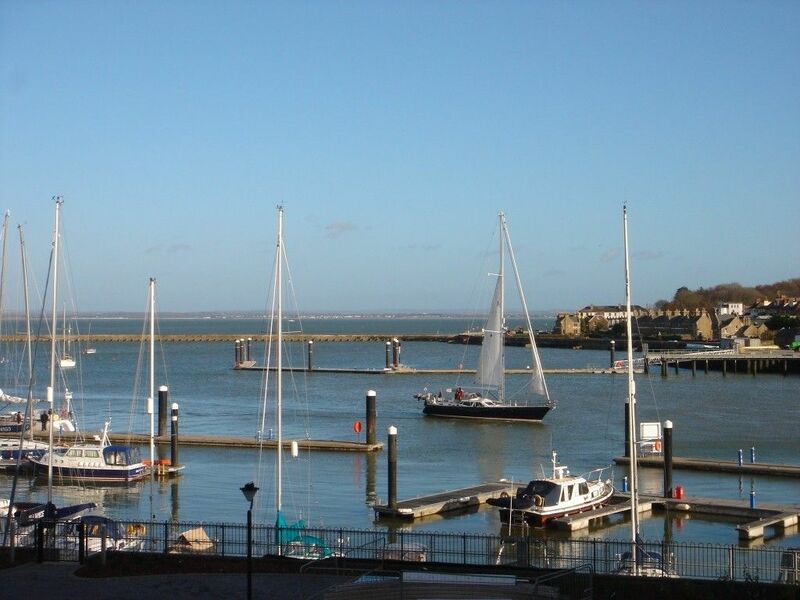 With its rich choice of sailing clubs, pubs and restaurants, the centre of Cowes offers entertainment for all. And there are many lovely shops selling all sorts of interesting things, not only sea and sailing related, and ideal for gifts or for your own use. And now Waitrose have decided to open - in East Cowes. Prices may be subject to change at the owner's discretion. Prices are for up to 4 persons. Additional persons charged at £40 per person/week. Bed linen, towels and tea towel provided. Cleaning is included. Saturday to Saturday is preferred, but alternative dates may be possible - please discuss with the owner. For Autumn/Winter/Spring rental, rate is £925 per month, excluding utilities. Please note that we are not able to accept children under 6 years old.